It's been a long time since I've written a review at all, much less put it up here for our blog, but when Heavy Seas was good enough to send me a bottle of their Seasonal Release in the Uncharted Water Series I figured it was the least I could do in return. 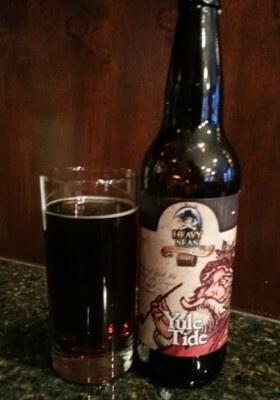 Yule Tide is an Imperial Red Ale aged in Jamaican Rum barrels. It weighs in at 9% abv and 28 IBUs. It is available in December and January wherever Heavy Seas products are sold. Pours a clean chestnut color, red but with more brown. Very little head reduces to a wisp on the surface and a ring around the glass. Stays that way for the remainder. The aroma is instantly sweet. Raisins and brown sugar. A touch of ginger. Maybe a bit of chocolate. The Barrel is there with more sweetness and no char. Touch of caramel. Taste starts off much the same. Brown sugar sweetness along with caramel maltiness. Barrel is much more present in the taste than the aroma. Touch of char, rum sweetness and a touch of spice. Ginger comes through at the end, really finishing things off and cutting out a bit of the sweetness. Medium full bodies. Lower carbonation that is appropriate for the style. Overall, an enjoyable beer, but 22oz might be a little bit much for one person to drink. I'd suggest sharing. Thanks go out to out to Caroline at Heavy Seas for sending me this beer!